It's a princess dress for Kate's birthday, in cotton candy colors. Here's my question: should I add those Tiny White Buttons for grommets? I think I should, but I'm lazy and want to leave the bodice as is. It's hard to resume sewing after a break away from it. But I know that if I don't sew something, I'll take up, I dunno, knitting or something, just for something for my fingers to do and maybe never return to sewing. And now that Kate is turning five, I'm panicking at the thought that my children's Dressing Up Days might well be numbered. So I'd better sew costumes while they still want them. Especially when I have so much costume fabric in my stash that needs to be used. and, while at the fabric store, can buy more yardage if it means not compromising on twirl factor (e.g. circular skirt rather than gathered skirt). Cannot be scratchy on the inside, especially since it isn't lined with fleece. Must finish in three days. Kate is allowed to see it, of course. I've long given up with the Secret Gifts concept in our house. I teased her a bit, when I caught her spying on me. I asked her, "Hey, Kate, I like this dress. I think I'll wear it when I'm done making it." "Because it's too small for you! It's for me and I'm four years old and you're, like, seventeen!" Bless you, Kate. Just for that, I will finish this dress in three days and not procrastinate by knitting or something. It's lined with jersey, which isn't scratchy (hurrah). Here are the back pieces. The left piece is flipped to show what it's supposed to look like. The right piece has a row of pins, one of which stabbed me viciously in the foot while I was photographing the front pieces. Incidentally, I pin stuff along the stitching line, not at right angles to it. Someone has asked me this before and up to that point, I never thought about pin direction. This was how I was taught - pin parallel to the seam allowances, preferably IN the seam allowances (so the holes don't show on the garment) and never sew over pins. There are times -like in this garment - when I pin exactly on the stitching line itself, and pull out each pin as the presser foot approaches it. Of course, I was also taught to hand-baste everything, even paper patterns to fabric, but it's hard to be so assiduous all the time (or at all). Later (like, not tomorrow or even next week), I'll show you some of the drafts for this dress. The sleeve, especially, is interesting. Provided it works, I mean. It's a semi-raglan puff (ugh) but with horizontal pleats. So it's a draped cut-in sleeve that's puff. I know, it sounds just awful. The draft looks like a Christmas tree. 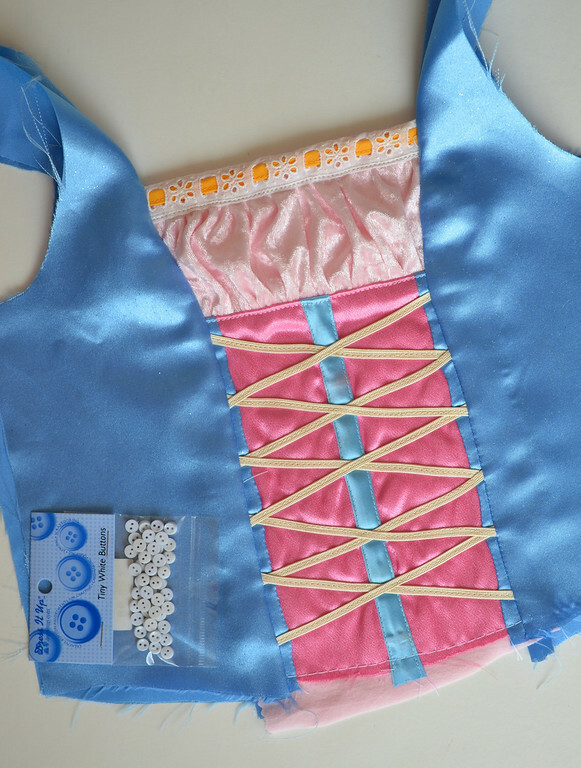 When I made my daughter's Rapunzel dress I sewed on some beautiful pearl buttons, I wish now I hadn't. They were a hand magnet, she was always pulling and playing with them, I ended up cutting them back off. I love the look of this fake corset! I will have to save this idea. My only question about your pins is: Do you sew towards the pin head or the pin point? 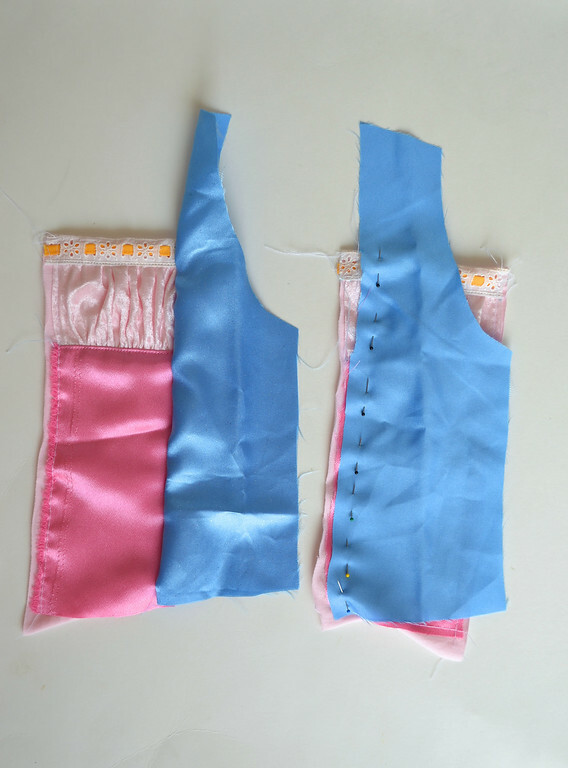 I pin this way as well - in the Seam allowance - but would have my pins in the other direction so i come up to a point and can remove the pin by the head with the seam allowance on the right hand side so all the material does not get bunched under the fabric. How does it work for you? I sew from the tail of the pin to the head, so sometimes the presser foot nudges the entire pin out of the fabric all by itself, too. So, in the photo, I'd be sewing from the top of the garment to the bottom, pulling each pin out as I come to it. Um, lazy?! You call that lazy?! Oh, the things we'll do for our kids...you are the best 17-year-old mom I know (not that I know you, but, you know what I mean). This proces is fun to watch come together. And, as a newbie to sewing, it's nice to hear how things were taught the 'proper' way (hand basting - really?!). Yes, hand-basting AND tailor's tacking. Shocking, I know. Not that I ever use the latter, I mean. I hand-baste all the time - especially with curves and princess seams and armscyes. Yes, use the buttons. It will look better. Buttons are not grommets. Tiny buttons will not look like grommets. The bodice will look better without the buttons -- after all, it's already beautiful! 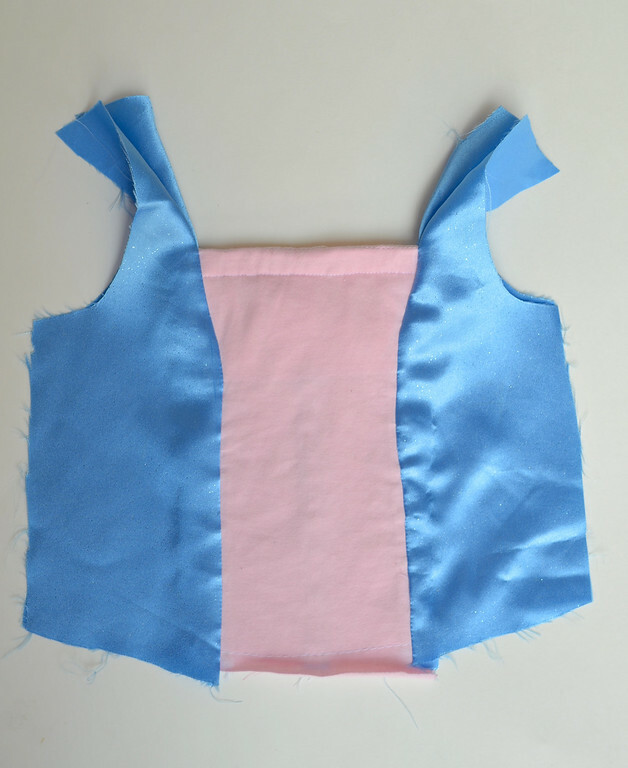 FWIW, you can pretend that the solid blue pieces on the sides are the outer bodice, which has been pinned in place over a stomacher. That is actually how such dresses were historically worn -- fastened with straight pins! And so the loops or eyelets holding the laces just aren't showing -- the bodice is pinned over top of them. The sleeve sounds quite interesting... I'm having a very hard time imagining it. Looking forward to seeing it! It's already gorgeous and, if I'm visualizing this correctly, the buttons will only distract from all the other beautiful details. I love the bodice; especially that gathered upper part; i'm a sucker for that. My opinion would be to leave up the buttons. I think it would be too much; you have so much action going on there as it is. Leave the buttons off LiEr - it's lovely without. I did a similar thing when I made a Rapunzel dress for my daughter's 5th birthday...you can see a photo here if you like: http://www.shelleymade.com/2012/09/the-rapunzel-dress.html It's her all time favourite dress up dress. Still gets worn in the heat of summer, and it does not catch on anything, like buttons might. I was going to use grommets and thread the ribbon - but decided against it! So glad I didn't now. Just remember - Kate will love it no matter what, and will wear it lovingly buttons or no buttons! Wow... great progress! It looks awesome so far, as I know the whole dress will. Can't wait to see the completion! Three days?! Yikes! Who says you are not 17? It's beautiful the way it is. Can't wait to see the finished outfit! Skip the buttons. I think I can visualise the sleeves, and how fantastic! Look forward to seeing the final photos. PS my opinion is no buttons. Very pretty! I'm excited to see what you mean with the sleeves. It's so fun to sew dress ups for girls. you sew pretty well for a 17 year old! Just kidding, 17 years olds sew quite well...when they want to. I love this little dress, it looks like the wedding dress I have designed in my mind (except more colourful of course). I must pin it just in case I need some extra pointers before the big day. Yes, switch back! Nothing wrong with how you used to pin. Recent article in Threads Magazine (3 issues ago, I think) stated that pinning parallel to the seam is the way to go. But then, to each her own. 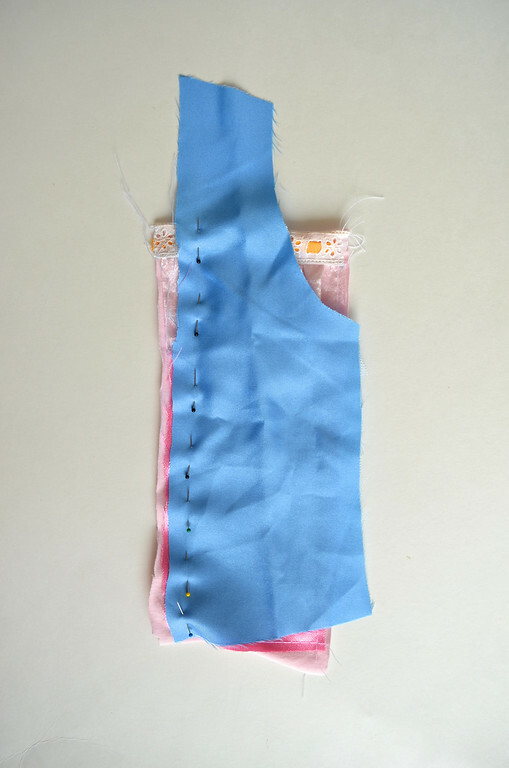 Just don't let the rest of the blogosphere tell you how to sew! Pin perpendicularly???? I was taught by my mum (and at school) to pin the same way as you do it, and everyone I have seen sewing around here also does it that way. Is it a particularly American thing to pin perpendicularly? Then do you sew over the pins or take them out as you go? Just seems so bizarre to me! Pip, I don't know what's American and what isn't. I've seen the perpendicular style on blogs much more than the parallel style. I always think, "Man, they have nicer pins than I do. Mine are just plain. Their's have flowers (or hearts or whatever)!" And then I feel old-fashioned. Your demonstration of modifying the inset of the sleeve and how to modify the pattern to accommodate the pleats is amazing! Thanks so much for posting... now I might make a princess dress for myself just to try it out :) I am currently working on finishing up a Washi dress for myself, but I probably need to modify the pattern because it is a little bit too wide in the shoulders for me. I also made it sleeveless because I wasn't sure how to modify the shoulder point, but now I'm going to try it. (i) Make the entire dress narrower, including the chest, waist and hip. 1/4" from the center front and 1/4" from the center back will take away an entire inch from the circumference of the chest, waist and hip, and 1/2" from the total shoulder width. If the whole dress happens to also be too wide, this might be a better fix. (ii) Make the neckline smaller. If the neckline is also too spread-out, this method will simultaneously fix that. Bear in mind that snipping that 1/4" from the center front will cause you to lose some of that little peekaboo keyhole (I'm assuming this Washi dress you're talking about is Rae's), so be sure to redraft that back in. If the entire shoulder width is too wide (i.e. from the edge of the neckline to the shoulder point where the sleeve attaches) but the chest, waist, hip and neckline itself are perfect, then the cut-in shoulder point method in my post might be a better fix. Nice information about Corset Dress. Thanks for sharing this.